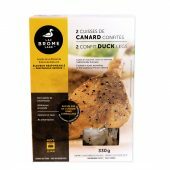 Remove the skin from the confit duck legs, shred the meat into bite-size pieces and set aside in a bowl. Bring salted water to a boil in a large saucepan. Cook the fusilli for about 10 minutes or until just al dente. In the meantime, cut the apples in half and remove the core. Slice the apples into thin wedges, and place in a bowl. Sprinkle with lemon juice, then mix to cover all the pieces thoroughly with the juice. Drain the pasta, then immediately add the butter, duck confit and garlic. Add salt and pepper to taste. Mix and leave covered for 5 minutes. Add the apple wedges (lifting them out of the bowl to leave the juice behind) and the shallots, and mix. 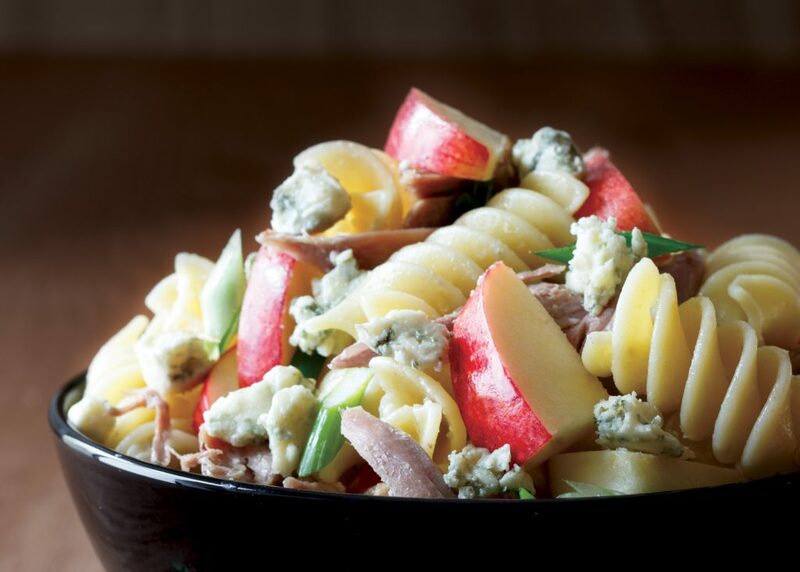 Serve the pasta in large bowls and garnish each serving with small pieces of crumbled blue cheese. Serve immediately. * Cheddar, aged 6 months or more, or gruyère may be substituted for the blue cheese.